Six years after the untimely passing of arguably the greatest Rock/Heavy Metal singer in history comes a compilation of the first six albums from the band that bore his name. 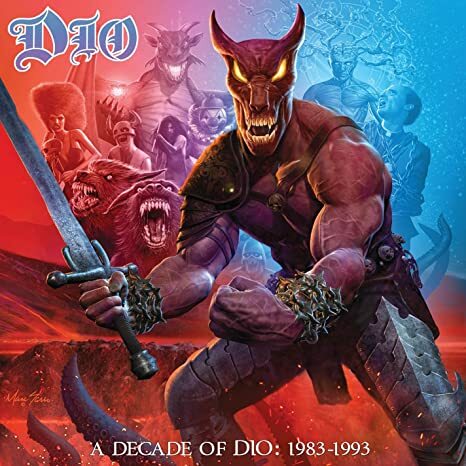 It's A Decade of Dio, and it features remastered versions of Holy Diver, The Last In Line, Sacred Heart, Dream Evil, Lock Up The Wolves, and Strange Highways. There isn't a dud in the bunch, with two of them being all time classics (Holy Diver and The Last In Line). So given that these albums have been available on CD for decades, is it really worth spending the money on this new box set? Well, for one thing the packaging is really cool. An outer box that holds the CD's in mini-LP/Record sleeves makes for a really nice looking package. For another thing, the remastering on some of these albums is the best to date, giving the albums a modern, but not brickwalled sound. Holy Diver has been released on CD no fewer than 4 times now, and this may be the best it has ever sounded. The Audio Fidelity Gold CD has the most accurate mastering job (no extra EQ, minimal compression) so it sounds the most like what they were hearing in the studio, but this version sounds a little better at home or, especially, in the car. It maintains the crisp, clear high end while adding more low end and warm mids. It is more compressed, enough that it could be seen as a negative, but it's not brickwalled so the instruments still have something of a chance to breathe (there is still some sonic space between them, so it maintains an open, clear sound - maybe not as much as the Audio Fidelity version or the original CD release, but moreso than the Deluxe Edition). Most notable, however, is how, "In your face," this version of Holy Diver sounds. It isn't just louder, it's punchier. The set starts off on a high note not just musically, but sonically as the newly remastered version of Holy Diver sounds fantastic. While the version of Holy Diver from this set is pretty much the best that album has ever sounded, this version of The Last In Line isn't quite as good. It's bigger, bolder, and beefier than previous versions - but it doesn't have that crisp high end that Holy Diver does (and it isn't quite as crisp as a couple previous releases of the album, either). It's close, but the guitar ends up getting lost just a tad in the process (not much, and not on all of the songs, but on a few it does get lost in the frequencies just a little). The high mids that really give guitars clarity aren't quite as present here as they could be (and were on previous releases). The difference is minor (most people wouldn't even notice - they'd just notice how much bigger the album sounds), but there is a difference. Still, this is a good job of remastering, just not great. Sacred Heart is an album that was a step down sonically from the two previous albums. It had great, crisp, clear highs and crunchy mids - but not much bass. Part of the problem was in the mix (not enough bass, and the bass was EQ'd without a lot of low end), but part of the problem was in the mastering (the original mastering engineer didn't add enough bass in his EQ to compensate). The Deluxe Edition was better, but still didn't have enough bass. That gave the (uncredited) engineer for this remastering a golden opportunity to come up with the definitive version of Sacred Heart on CD. He didn't quite get that done. He didn't miss by much, though. There is more bass than this album has ever heard, and there are more low mids to warm up a sound that had been just a little harsh on previous releases. Unfortunately, that high end that gave the album it's crispness has been reduced, muddying up the sound ever so slightly. Again, we're talking marginal degrees that not everyone will be able to hear, but it is a little muddier than previous releases. Like Holy Diver and The Last In Line from this set, Sacred Heart is now more, "In Your Face," than ever before, and it will sound great in the car, and this is likely the best that this album has ever sounded. It's not perfect, but it's close. Like Sacred Heart, Dream Evil gives a mastering engineer a chance to put his stamp on the album and come up with the definitive CD release. The original mix by engineer Angelo Arcuri was a little muddy, not helped by Craig Goldy's guitar tone (which was the source of much of the sonic sludge). That can be fixed somewhat by carefully re-EQ'ing the album and adding more highs and high mids (while at the same time adding some punchy lows to create more clarity for the bass guitar). Is this the definitive release on CD for Dream Evil? Yes, but there is still a little room for improvement. It could be better, but not a lot. There is more of a crisp, clear sound than on previous releases, but there is less sonic space than on the other albums in this set, and there could be more highs and high mids than have been added here - not too much more, though, as that would create a harsher, somewhat unpleasant sound. Given the mix and the previous mastering jobs, though, this has to be seen as a significant success. Dream Evil hasn't sounded better than this before, and that's a major accomplishment. Another album with issues in the mix that make it hard to make a big sonic improvement is Lock Up The Wolves. The guitars are just a little muddy (not as much as on Dream Evil, but not as crisp as Vivian Campbell's tone), and the drums & vocals dominate the mix in such a way that the guitars are reduced to a supporting role more than they should be for this type of music. How to fix that? This would be a case where significant compression would actually be an asset. Limiting the drums to a maximum level not much higher than the guitar and bass would help bring out the guitars. Also, the snare is a little overprocessed (not egregiously so, but definitely a bit overprocessed and harsh). This one is tricky, you want to make the guitars crisper and clearer without making the snare harsher. That calls for adding more mids with just a slight increase of high mids, and then adding those punchier bass frequencies. That, along with added compression, would make for a better listening experience. And, to a degree, that's what we got with this release. It could actually stand for a little more compression, and a bit more of the mids to bring out the guitar a little more, but it still is an improvement over the original CD. Of all of the DIO (the band) albums, the two that really needed the least work as far as remastering goes it would have been Holy Diver and Strange Highways. The original mix and mastering of Strange Highways was excellent, with no real deficiencies or flaws. So remastering this album should have been easy, right? Apparently not. While a few of the tracks on this edition of Strange Highways sound better than the original CD, many of them sound worse, becoming muddier and less defined. It starts out fairly promisingly with, "Jesus, Mary, and the Holy Ghost," sounding really, really good, but then, "Firehead," sounds both better and worse. The EQ is better than the original on, "Firehead," but it's overcompressed and lost it's sonic breathing room. Other songs that suffer from either overcompression or muddied up EQ include the title track, "One Foot In The Grave," "Here's To You," and, "Bring Down the Rain." Overall, the album sounds a little less spacious than the original release, even if it sounds bigger and bolder. Still, it's not a total loss as this version sounds better in the car (where you need more compression to overcome the road and engine noise). This is a great, underrated (and often underappreciated) album that deserved a better job of mastering. Not bad, really, just not great (and it easily could have been). 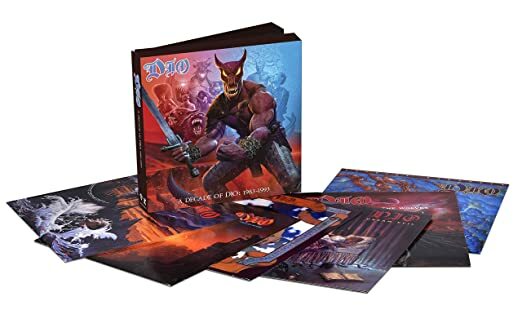 So, overall, this is a great set to buy if you don't have all the titles already in your collection (the price is definitely right for the CD set), or if you want improved sound on 5 of the 6 albums in the set. Definitely - Recommended!